I have always wondered about traveling to Europe, more specifically Paris, France. I just love the thought of, its so touristy and looks like you can take really cool pictures. It’s just somewhere I have always wanted to go to! I see pictures of people at the Eiffel Tower, the Louvre Museum, the Notre-Dame de Paris, and the Arc de Triomphe. It just look so cool, all of the unique structures and just how all of the building were built. I have always wanted to go there for at least 2 weeks so I can go around and really see Paris, France. I know that everyone wants to go there because it is the “The City of Love’’ but I just want to go because of everything I have heard about it, all of the history behind it is just amazing. Like the Eiffel tower, it was built because of the French Revolution. Many people just go there because it’s supposed to be the place of romance, and yeah that might be a reason for me to go there but I’m also someone who gets interested by the history of a place rather than what it is known for. I also know that the sunsets that are captured there are so pretty! 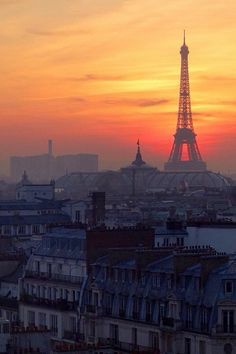 The sunsets in Paris are multicolored with colors that really complement each other. Now you might say that the sunsets is just at certain times or it’s photographed to be like that or it’s edited. However I like to consider myself a photographer, so even if there is a chance that when I go there the sunsets is going to be beautiful than I’ll take that chance because even though the sunsets would be a good addition, there are so many more wonderful places in Paris. To be a hundred percent honest, sunsets are amazing anywhere you go no matter how they look because of the colors the sun makes as it sets. Now that is a fact. womanhood, like a shield or a mirror. However people say that an “artist” wanted to change the meaning and cut the arms off. The statue has been like that for so long that people do not know it as a statue with hands. However when a professor did a 3D reconstruction, it was determined that once long ago the statue really did have arms and the arms are said to be carrying something. I can’t figure out what message the secondary artist was trying to convey. Even though I may never get that message, and all of the other mysteries of Paris, I would still love to go there. I’ve said this so many times in this blog but I want to see everything behind the city of Paris. I want to see the parts of Old Paris, and New Paris. I want to see the places where famous artists like Van Gogh lived and stayed. I want to see the Eiffel tower and The Venus de Milo as its original meanings. Going to Paris and to just travel around the world and take pictures is just something that I have always wanted to do.